So, if you’re like me, you have about 20 million people you’d love to buy a small gift for and let’s face it, there usually isn’t enough time, money, etc. to get ALL the people on your list. I had several people that I wanted to say Merry Christmas and give a little something to, so I decided I needed a treat to hand out. 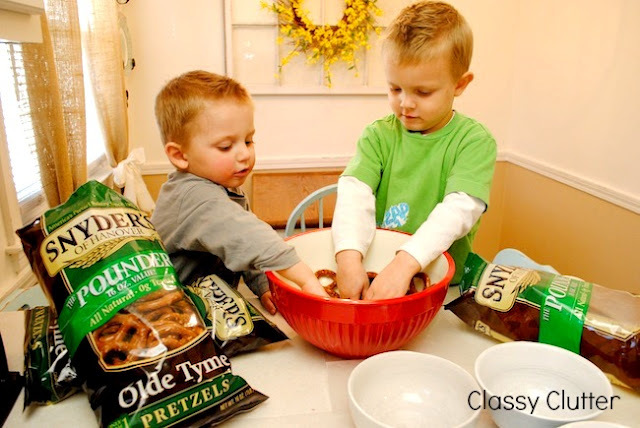 Pretzels are a big hit at our house and chocolate covered anything is a big hit with…well everyone! 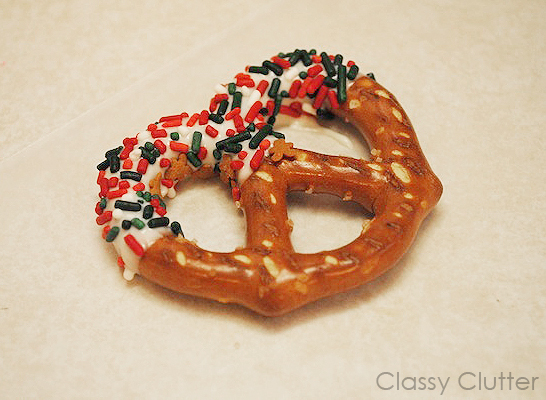 Chocolate dipped pretzels seemed perfect! It’s really so simple to make them and they are a really budget friendly gift. 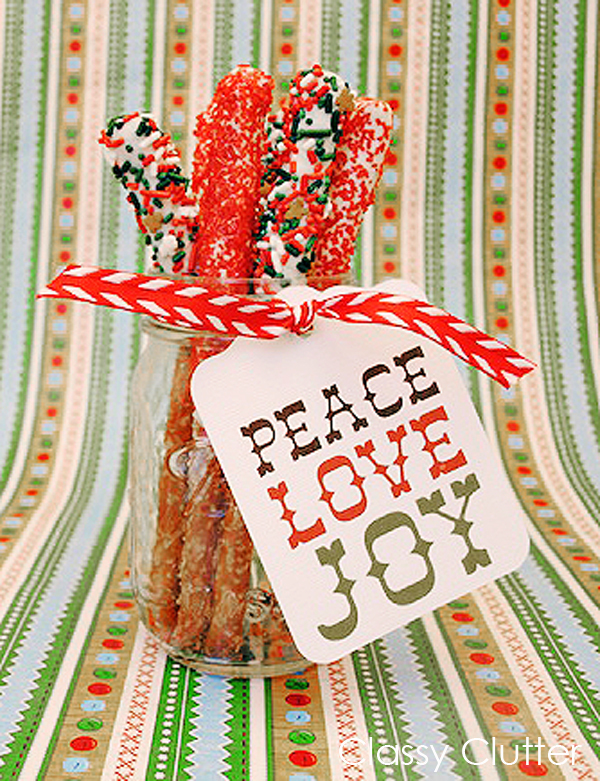 A bag (or more) of pretzels – I used Synder Hanover Olde Tyme pretzels and pretzel rods for my gifts. Chocolate – I used Nestle Premium White Chocolate bars for baking. 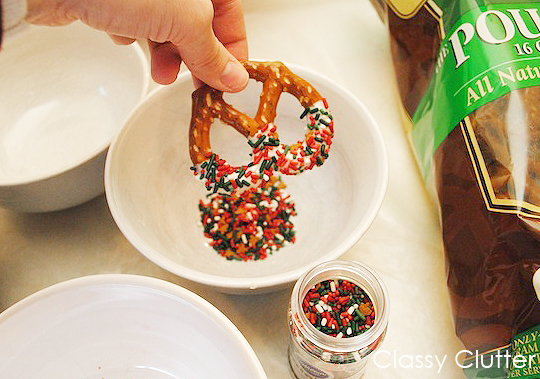 When the chocolate , you’ll dip your pretzels into the melted chocolate. 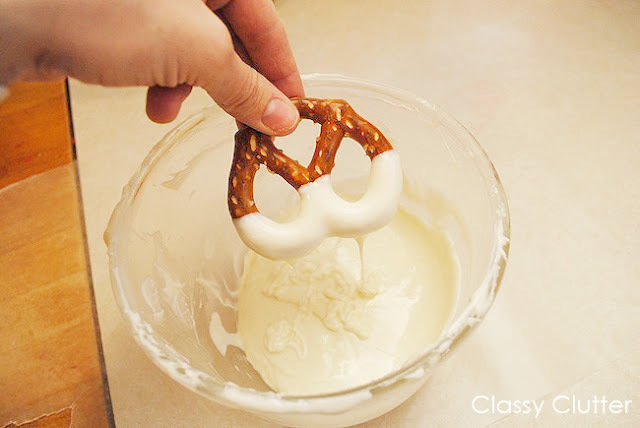 Shake gently to remove dripping chocolate and wipe the back side of your pretzel on the side of the bowl to remove the chocolate on the back. Then, all you do is add sprinkles! I placed a bowl underneath to catch the extra and then put them back in the bottle and reused them until I ran out. 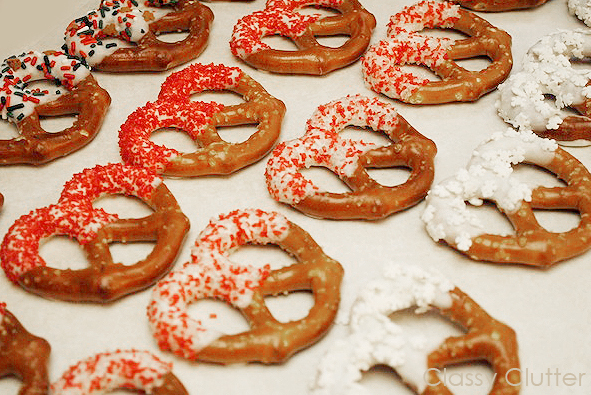 Lay the pretzels out on wax paper and wait for the chocolate to cool before you bag them up. It takes about 15 minutes or so. I used 4 different sprinkles. Let me tell you, the red sugar crystals are cinnamon flavored and delicious! The red and white sugar crystals are peppermint and soooo good too! The perfect mix of sweet and salty for Christmas! The white ones are little snowflakes and so cute! These cuties wanted in on the fun so I gave them the super important job of sorting through the pretzels to take the broken ones out of the bag. They we’re loving it! Finally, I bagged 5 or so pretzels in each bag and added a tag and ribbon. 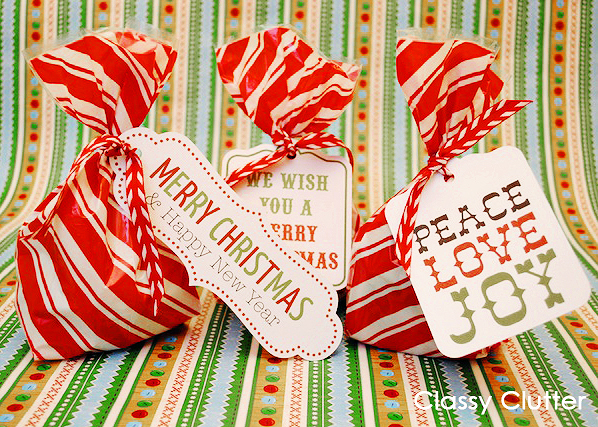 The bags were from my grocery store and the tags were a “print and cut” from Silhouette; the ribbon is from Michaels. I made these bags for my little Parker’s nursery leaders at our church and a bunch of others for Carter’s preschool teachers, friends, neighbors etc. I also dipped a few pretzel rods and placed them in a mason jar with the tag and I think they looked so cute! Carter delivered these ones to our favorite neighbors! He was so excited to give the pretzels to them. That’s it! So easy right! ?